we are leading suppliers & exporters of "Sofosbuvir 400 Mg And Ledipasvir 90 Mg"in China, Russia, Hongkong, Bulgaria, Romania, India. Description - The Brand name of this medicine is Hepcvir L . Hepcvir L medicine contains generic Ledipasvir & Sofosbuvir . Ledipasvir & Sofosbuvir are available in form of Tablets. Each Coated Tablet contains 90 Mg Ledipasvir & 400Mg Sofosbuvir. One Pack of Hepcvir L contain 28 Tablets. Manufacturer & Marketed company name of Hepcvir L is Cipla Pharma Ltd, India. 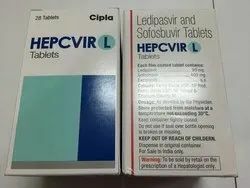 USED - HEPCVIR L is a combination of sofosbuvir and ledipasvir is used to treat chronic hepatitis C, a viral infection of the liver. Warning: Hepcvir L medicine out of the reach and sight of children and away from pets, never share your medicines with others, and use this medication only for the indication prescribed. The information contained herein is not intended to cover all possible uses, directions, precautions, warnings, drug interactions, allergic reactions, or adverse effects. Description - Brand name is MyHep LVIR. 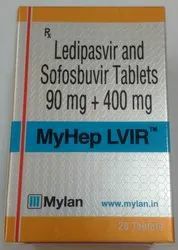 MyHep LVIR medicine contains generic Ledipasvir and Sofosbuvir. Ledipasvir and Sofosbuvir available in form of tablets. Each film coated tablets contains 90 Mg Ledipasvir and 400Mg Sofosbuvir. One Pack of MyHep LVIR contains number of tablets is 28. Manufacturer Marketed company name of MyHep LVIR is Mylan Laboratories and Marketed by Mylan Pharmaceuticals Limited, India. USED - Myhep Lvir Tablet helps in the treatment of chronic hepatitis C (HCV). Dosage- As ditrected by Physician. Warning: MyHep LVIR medicine out of the reach and sight of children and away from pets, never share your medicines with others, and use this medication only for the indication prescribed. The information contained herein is not intended to cover all possible uses, directions, precautions, warnings, drug interactions, allergic reactions, or adverse effects. Description - The Brand name of this medicine is Sofab Lp . Sofab Lp medicine contains generic Ledipasvir & Sofosbuvir . Ledipasvir & Sofosbuvir are available in form of Tablets. Each Coated Tablet contains 90 Mg Ledipasvir & 400Mg Sofosbuvir. One Pack of Sofab Lp contain 28 Tablets. Manufacturer & Marketed company name of Sofab Lp is Sun Pharma, India. USED - SOFAB LP is a combination of sofosbuvir and ledipasvir is used to treat chronic hepatitis C, a viral infection of the liver. Warning: Sofab Lp medicine out of the reach and sight of children and away from pets, never share your medicines with others, and use this medication only for the indication prescribed. The information contained herein is not intended to cover all possible uses, directions, precautions, warnings, drug interactions, allergic reactions, or adverse effects. Description - Brand name is Ledifos. 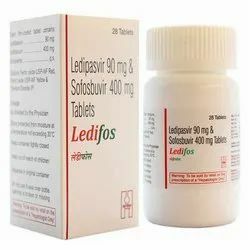 Ledifos medicine contains generic Ledipasvir and Sofosbuvir. Ledipasvir and Sofosbuvir available in form of tablets. Each film coated tablets contains 90 Mg Ledipasvir and 400Mg Sofosbuvir. One Pack of Ledifos contains number of tablets is 28. Manufacturer company name of Ledifos is Hetero Labs Ltd and Marketed company name of Ledifos is Hetero Healthcare Ltd , India. USED - Ledifos 90Mg/400Mg Tablet helps in the treatment of chronic hepatitis C (HCV). Warning: Ledifos medicine out of the reach and sight of children and away from pets, never share your medicines with others, and use this medication only for the indication prescribed. The information contained herein is not intended to cover all possible uses, directions, precautions, warnings, drug interactions, allergic reactions, or adverse effects. Description - The Brand name of this medicine is Ledihep . Ledihep medicine contains generic Ledipasvir & Sofosbuvir . Ledipasvir & Sofosbuvir are available in form of Tablets. Each Coated Tablet contains 90 Mg Ledipasvir & 400Mg Sofosbuvir. One Pack of Ledihep contain 28 Tablets. Manufacturer company name of Ledihep is Natco Pharma Ltd and Marketed company name of Ledihep is Zydus Heptiza, India. 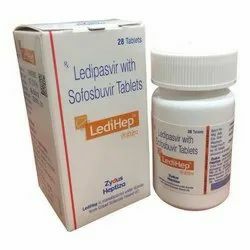 USED - Ledihep is a combination of sofosbuvir and ledipasvir is used to treat chronic hepatitis C, a viral infection of the liver. Warning: Ledihep medicine out of the reach and sight of children and away from pets, never share your medicines with others, and use this medication only for the indication prescribed. The information contained herein is not intended to cover all possible uses, directions, precautions, warnings, drug interactions, allergic reactions, or adverse effects. Description - The Brand name of this medicine is Novisof L . Novisof L medicine contains generic Ledipasvir & Sofosbuvir . Ledipasvir & Sofosbuvir are available in form of Tablets. Each Coated Tablet contains 90 Mg Ledipasvir & 400Mg Sofosbuvir. One Pack of Novisof L contain 28 Tablets. Manufacturer & Marketed company name of Novisof L is Wockhardt Ltd, India. USED - Novisof L is used to treat hepatitis C, a viral infection of the liver. Warning: Novisof L medicine out of the reach and sight of children and away from pets, never share your medicines with others, and use this medication only for the indication prescribed. The information contained herein is not intended to cover all possible uses, directions, precautions, warnings, drug interactions, allergic reactions, or adverse effects. Description - The Brand name of this medicine is Ledviclear . 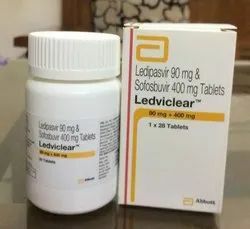 Ledviclear medicine contains generic Ledipasvir & Sofosbuvir . 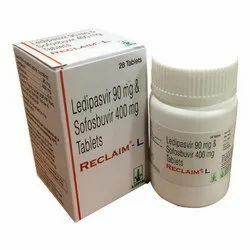 Ledipasvir & Sofosbuvir are available in form of Tablets. Each Coated Tablet contains 90 Mg Ledipasvir & 400Mg Sofosbuvir. One Pack of Ledviclear contain 28 Tablets. Manufacturer & Marketed company name of Ledviclear is Abbott, India. USED - Ledviclear is a combination of sofosbuvir and ledipasvir is used to treat chronic hepatitis C, a viral infection of the liver. Warning: Ledviclear medicine out of the reach and sight of children and away from pets, never share your medicines with others, and use this medication only for the indication prescribed. The information contained herein is not intended to cover all possible uses, directions, precautions, warnings, drug interactions, allergic reactions, or adverse effects. Description - The Brand name of this medicine is Reclaim L . Reclaim L medicine contains generic Ledipasvir & Sofosbuvir . 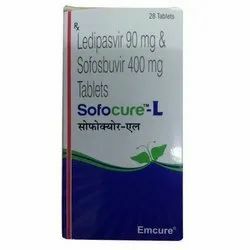 Ledipasvir & Sofosbuvir are available in form of Tablets. Each Coated Tablet contains 90 Mg Ledipasvir & 400Mg Sofosbuvir. One Pack of Reclaim L contain 28 Tablets. Manufacturer & Marketed company name of Reclaim L is Lupin Ltd, India. USED - Reclaim L is used to treat hepatitis C, a viral infection of the liver. Warning: Reclaim L medicine out of the reach and sight of children and away from pets, never share your medicines with others, and use this medication only for the indication prescribed. The information contained herein is not intended to cover all possible uses, directions, precautions, warnings, drug interactions, allergic reactions, or adverse effects. Description - The Brand name of this medicine is Resof L . Resof L medicine contains generic Ledipasvir & Sofosbuvir . 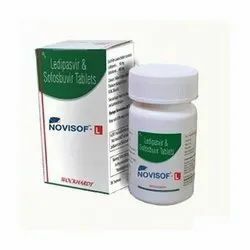 Ledipasvir & Sofosbuvir are available in form of Tablets. Each Coated Tablet contains 90 Mg Ledipasvir & 400Mg Sofosbuvir. One Pack of Resof L contain 28 Tablets. Manufacturer & Marketed company name of Resof L is Dr. Reddy's Labs Ltd, India. 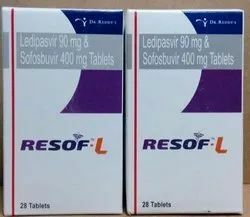 USED - Resof L is a combination of sofosbuvir and ledipasvir is used to treat chronic hepatitis C, a viral infection of the liver. Warning: Resof L medicine out of the reach and sight of children and away from pets, never share your medicines with others, and use this medication only for the indication prescribed. The information contained herein is not intended to cover all possible uses, directions, precautions, warnings, drug interactions, allergic reactions, or adverse effects. Description - The Brand name of this medicine is Sofocure L . Sofocure L medicine contains generic Ledipasvir & Sofosbuvir . 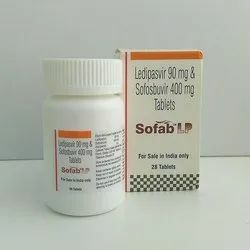 Ledipasvir & Sofosbuvir are available in form of Tablets. Each Coated Tablet contains 90 Mg Ledipasvir & 400Mg Sofosbuvir. One Pack of Sofocure L contain 28 Tablets. Manufacturer & Marketed company name of Sofocure L is Emcure Pharma Ltd, India. USED - Sofocure L is a combination of sofosbuvir and ledipasvir is used to treat chronic hepatitis C, a viral infection of the liver. Warning: Sofocure L medicine out of the reach and sight of children and away from pets, never share your medicines with others, and use this medication only for the indication prescribed. The information contained herein is not intended to cover all possible uses, directions, precautions, warnings, drug interactions, allergic reactions, or adverse effects.